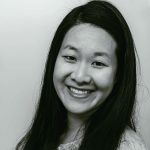 Published May 24, 2018 By Julia 3 CommentsThis post may contain affiliate links. 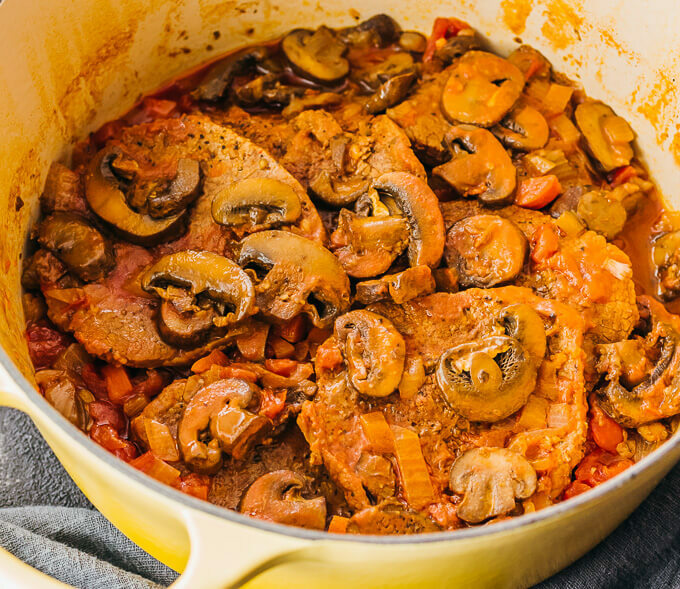 An easy recipe for Swiss Steak with tomatoes and mushrooms, cooked in one pot on the stove. Low carb, keto, and gluten free. 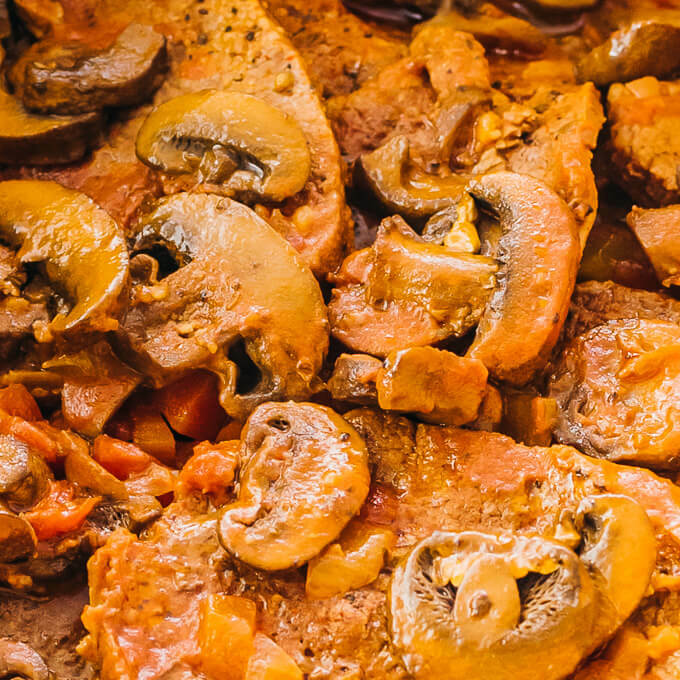 Swiss steak refers to tenderized, seasoned beef that’s braised in a pot of tomatoes, mushrooms, and other vegetables. Some also call it “smothered steak,” especially if they’re from the South. But why is it called Swiss Steak? 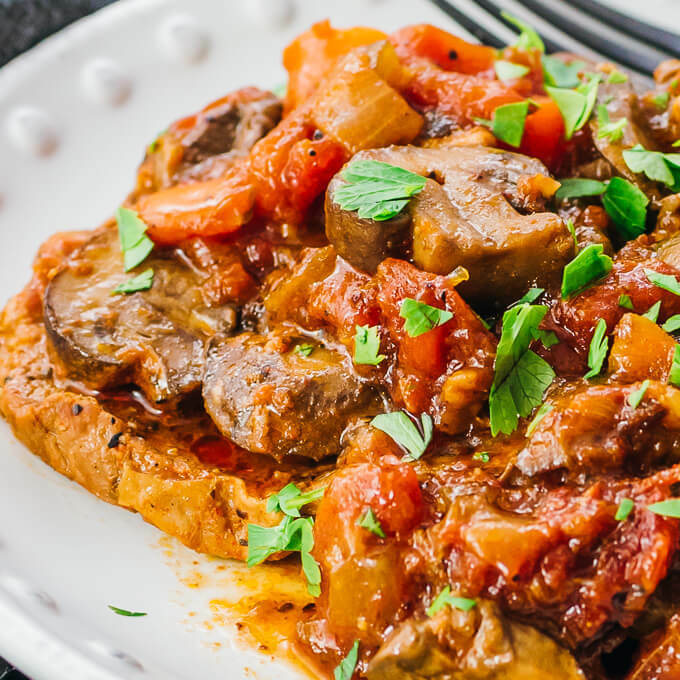 Contrary to what one might think, Swiss steak doesn’t originate from Switzerland. The “Swiss” part of the name comes from “swissing” the meat, which is a tenderizing technique where meat is pounded or rolled. The flavors in Swiss steak are fantastic. 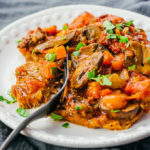 Due to the long simmering, the liquid in the pot reduces to an intensely flavorful sauce with a rich taste of tomatoes, carrots, and mushrooms. The spices used to season the beef add a nice kick. And the beef is fall-apart-tender! This recipe skips the traditional step of pounding the meat. Since the beef is cut into relatively thin slices (1/2 inch thick) and simmered for a long time, the resulting meat is quite tender already. 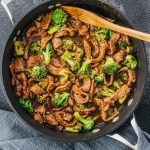 To make this dish healthier and low carb, the beef isn’t tossed in flour before browning nor is the sauce thickened with corn starch. Instead, the recipe uses only a small amount of liquid so that the resulting sauce is already thick. 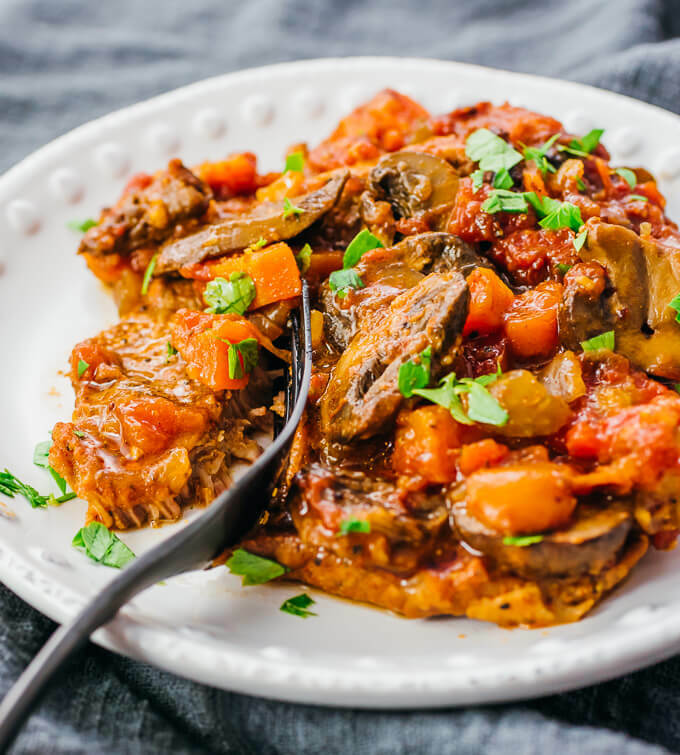 Swiss steak is made using beef from the “round” region, which refers to a cow’s rear leg. 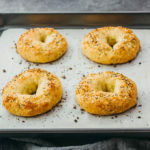 You can use any round cut for this recipe, including eye of round, bottom round, and top round. It should be a relatively lean and tough cut. After slicing the meat, coat it with dry seasonings like salt, pepper, paprika, and oregano. The slow braising really brings out these spices’ flavors, especially the hint of heat from the paprika. I use a 6 quart dutch oven. 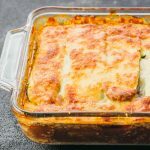 You can use one as small as 4 quarts for this recipe, but it may take multiple batches to brown all of the meat. I haven’t experimented with using cookware other than a dutch oven. If you use another kind of pot, your simmering time may vary a bit, but you’ll know it’s done when the beef is very tender and nearly falling apart. The sauce should be quite thick. 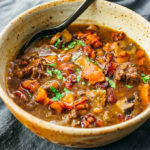 This recipe can also be easily adapted for a slow cooker — I suggest cooking on low for at least 8 hours to tenderize the meat. You’ll need a separate pan for browning the meat and sauteing the vegetables. 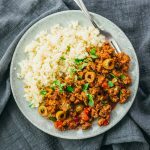 For convenience, you can use an Instant Pot or similar multi-cooker. 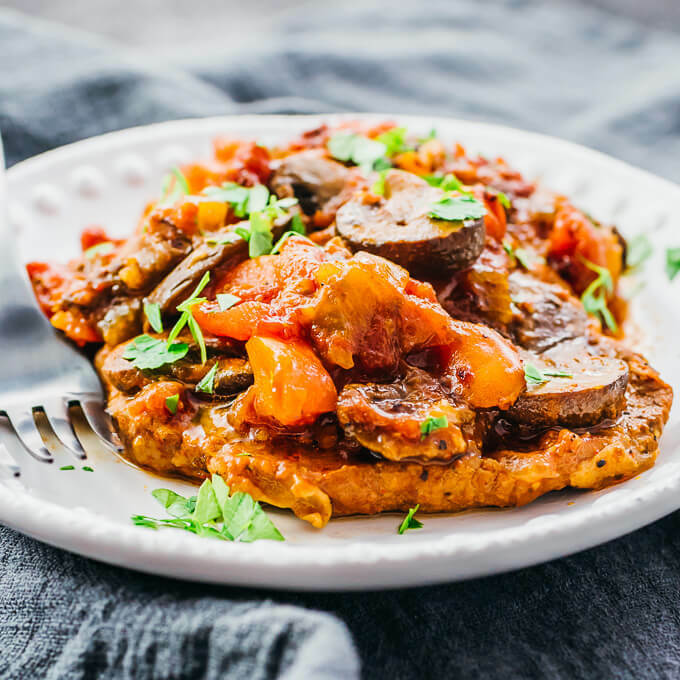 Given the intense flavor of the tomatoes, serve Swiss steak with something simple. Traditionally, it’s paired with a plain starch like pasta, mashed potatoes, or rice. 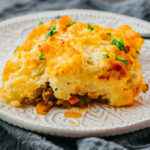 If you follow a low carb diet as I do, I recommend serving with mashed cauliflower. You can complete this dinner with a simple green salad or a side of vegetables like green beans, asparagus, or cauliflower. Trim the beef of any excess fat, and cut into round slices about 1/2 inch thick. Pat dry with paper towels. In a small bowl, combine all dry seasonings and stir to mix well. Add sliced beef and all seasonings to a resealable bag. Toss until the beef is well-coated. Heat olive oil in a 4 quart or larger dutch oven or pot over medium to medium-high heat for a few minutes until hot. Working in 2 batches: add beef slices in a single layer and brown for about a minute, flip to brown the other side, then transfer to a large bowl. Add onions, carrots, celery, and garlic to the pot. Cook for a few minutes until aromatic, stirring frequently. Add diced tomatoes (including liquid in the can), Worcestershire sauce, and 2/3 cup water. Stir together until well-mixed. Return the beef slices and any bowl drippings to the pot, snugly arranging the beef on top of the vegetables. Evenly distribute mushrooms on top. Cover with a tightly fitting lid. Cook over medium-low heat for 2 hours, or until the beef is very tender and nearly falling apart. Uncover and turn off the heat. Transfer only the beef slices onto serving plates. Stir together the vegetables and sauce in the pot, scraping up any brown bits stuck to the bottom, and spoon them over the beef. Top with parsley and serve. 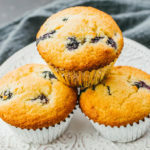 This recipe yields 7.5 g net carbs per serving. Great recipe, however I substituted venison cube steaks instead of beef and it was delicious. Keep your creative juices flowing! Great job, Julia! how long would you cook it in an instant pot? i’m trying to learn how to do most recipes in this fabulous appliance, since it gets HOT here in northern california in the summer & nobody wants to cook! Hi Donna! I actually have an Instant Pot version of this recipe that I’m planning on publishing on the blog in 2 weeks. It takes about 30 minutes at high pressure followed by a 10 minute natural release. There’s a lot of liquid in the pot, so afterwards you’ll need to put it on the saute mode to boil it down and condense the flavors, another 20 minutes or so.